[April 2011] For as long as anyone remembers, Fishguard’s train service has been virtually non-existent. One daytime return train meets the midday Irish Ferry. Another in the small hours meets the night ferry. Do you know anyone from Pembrokeshire who’s willingly taken the 1:50am train from Fishguard? It reaches Swansea at 3:25, with half an hour to wait for the 3:57 to … well you get the point. The campaign for a proper rail service for north Pembrokeshire has run for years. After endless delays and disappointments, suddenly it’s all change: from September 2011, Fishguard will have five extra trains both ways to Carmarthen, where we’ll change for Swansea, Cardiff, London, Manchester, the world … And Fishguard is suddenly just a day trip away for a million and a half people in south-east Wales. They have many good reasons to visit north Pembrokeshire, and it’s getting much easier. In three years the trial service will be reviewed. We wouldn’t want to lose it. So now it’s up to us – families, students, retired, visitors, workers, holidaymakers, festival-goers: use the new service, and make sure it delivers what we need. We’re here to encourage involvement, and to support the brilliant campaigning of the North Pembrokeshire Transport Forum. Happily their work continues. Fishguard Trains is an independent website run by an informal group of local rail users. We’ll support use of the new service, report its news, good and bad, give everyone a voice in its development. The new service will only be as good as the connections it creates. At first, that’s in the hands of Arriva, Pembrokeshire CC and WAG, so we’ll be watching closely what they do. But they can only deliver the service. It can’t reach its potential without active public involvement – that’s your job. Just chanced upon the new service on the Arriva website, then did a search and found your page with a lot more information about trains to Fishguard. Publicity should be given to these new train times: I wish you every success, and shall come and try out one of the new services soon. Thanks Andrew. Check the TIMETABLES section for the latest times and connections. Fishguard Trains publishes (online and in print) a special timetable to cover journeys across Pembrokeshire, across Wales and across Europe – all using our new rail service. We agree, publicity is vital for the service to succeed. It’s great that Fishguard has got it’s trains back. A nice change from the seemingly endless running down of vital rural services and needless cuts. With respect to the comment above about ‘willing’ passengers on the 1.50 am service. Well,here’s one! Having an appointment in South Wales back in the mid eighties,I remember leaving the Harbour and staring out of the windows into pitch darkness, not knowing,half the time,where I was. I finally got to my destination,in Port Talbot & had to wait for ages,in the freezing cold & murky light of dawn, before even a shop opened! Still,I got to my appointment & fair play,other than the time of departure,I can’t say I had any complaints about the actual rail journey. On the other hand,1.50 am,for a mid morning appointment in South Wales does make you realise why having these extra trains is so important. I only wish they’d had these extra trains then! The final train of the day from Cardiff to Fishguard, ex Cardiff 17.40, is known as the “Sardine Express” because it is swamped with commuters travelling from Cardiff to Swansea. Last Monday returning to Fishguard (14/11/2011) I stood from Cardiff to Swansea standing on a suitcase because there was no floor space left on which to stand; a two-coach 175 unit was hopelessly inadequate to deal with the crush of passengers. This is effectively going to kill off the Fishguard service if passengers are physically unable to get on the train. (The service from Swansea was fine). I can understand this. I was lucky to catch it when It was worked by a 3 carriage 175 and even that struggled to cope. I have seen staff at cardiff central actually ask people traveling to Bridgend etc to get off the train and wait for the 17:48 swansea services as passengers fior Milford Haven . The problems with the 17:39 is that i also calls at Pyle which is a busy railhead for Porthcawl etc and is a very busy station during the peaks. I personally think that FGW should have gotten those 4 carriage 172’s for the Cardiff – Portsmouth route to allow their class 158’s to be re-formed back into 2 carriage sets so that some could come to ATW for the Cambrian and to provide extra capacity. Otherwise the WG could get some use out of those MK2 carriages stored at Long Marston after they have been refurbished and put onto the Manchester services or provide a relief service which leaves Cardiff at 17:30 and calls at Bridgend & Port Talbot Parkway before running via the Swansea District Line and Carmarthen to Fishguard Harbour (Arriving at 19:55) this allowing the unit which does the shuttle to operate through to Carmarthen which is better for through passengers rather than changing at Claberston Road. Should have also included when I travelled on the 17:39 which was worked by a 3 carriage 175 was that passengers going to Bridgend, Port Talbot etc were asked to catch the 17:48 HST which wouldnt be as busy and so the 17:39 would have enough room for long distance passengers. Mind you I know now why the 17:48 HST can be relatively quiet for the time it departs from Cardiff. On a slightly different note, I noticed that the train announcement at Cardiff Central Station for the 17:39 made no reference to the connection to Fishguard. I think it would be helpful if it did in order to make the travelling public aware of the new service, and obviously better inform people travelling on the day. Could we contact Arriva Trains Wales to make this request? Interesting point Mr Davies. Anouncement of the connection would indeed be rather useful. However right now I cannot think of any station which announces connections, perhaps if all connections were listed the announcments would be too long so they decide not to bother at all? On the train is a different matter, they do give connection announcements but normally only on approach to the connection station, perhaps they should give advance announcements more often (when I used the 17:39 they did give some mentions of the Fishguard connection, but not before Swansea I seem to remember). On the crowding issue, perhaps this is yet another advantage of introducing more regular express services via the Swansea District Line. That would keep passengers for Swansea off the Cardiff to west Wales services. You would still need the current frequency via Swansea of course, but if there was an hourly district line train to Cardiff would it matter if going via Swansea meant you had to change in Swansea? (eg. the Manchester – Carmarthen/Milford services could be replaced by Manchester – Swansea services (using longer trains, probablly loco-hauled due to shortage of any other stock) with additional Milford/Pembroke/Carmarthen – Swansea workings introduced to maintain the Carmarthen – Swansea frequency). I still don’t understand why the daytime boat train from Fishguard does not stop till Whitland. If a stop were inserted at Clarbeston Road a convenient connection could be made to Milford Haven. I wanted to do this on a visit in 2010 but the timetable did not permit it. Particularly bonkers as the train stops at Clarbeston Road box to hand in the token. I wrote to Arriva Wales but no luck! Very pleased to see you have achieved a reopening of Fishguard & Goodwick. Stopping twice at Clarbeston Road is a bit bonkers too. Shame the token exchange can’t be done in the platform. Still, there are buses from Fishguard to Haverfordwest, the new trains are really for trips to Carmarthen and Swansea. If you’re from Fishguard or Goodwick and want a trip to either, go by train, we’ve a decent service for doing that at last. The Fishguard connection off the 17:39 from Cardiff is certainly shown on the departure screen PIS at Carmarthen as ‘connection for Fishguard Harbour at Clarbeston Road’. I will check Swansea and Llanelli next time I’m in the area and will see what can be done at Cardiff etc. ATW are advertising the service better now, and even the Pembrokeshire Railcard deal is being pushed far better than 12 months ago. Lets get our 7 trains each way better used before we start thinking about a regular hourly service over the Swansea district line Rhydgaled – let’s fight the battles that have a chance of being achieved! I agree, no fighting about hourly service over the SDL. Fight for 1 extra SDL train each way (at times I’ve suggested) and fight to preserve the infrastructure of the SDL so that one day in future we can try and get an hourly service between Cardiff and Carmarthen with a 1hr 15min journey time. That day is a long way off, but we need to ensure the infrastructure will allow it when the time comes. Despite having no connection to Pembrokeshire (my only real link to Wales was when I studied at Aberystwyth University-graduated last year and volunteer at the Corris Railway near Machynlleth) and being unlikely to use the service in the near future (mainly because I live in Essex) I am glad to see that the welsh assembly government/arriva/any misc others have not only opened a new station closer to town but introduced new train services. Since the 1960’s (and probs before) when it comes to railways politicians have failed to realise the potential of some of the lines/stations and shut them or reduced services to the point that people drive/take the bus to a nearby station where there are more services (and then they wonder why no one uses the service). Anyway Good Luck and I hope you get more trains! If you are lucky you could end up with a 2 hourly service which (Arriva timetable person if you are reading this) could join up with the 2 hourly (I think) Pembroke service at Whitland which goes to Swansea or Cardiff (if memory serves). Would also provide more seats between Whitland and Swansea/Cardiff. In this area, some people drive to Port Talbot Parkway. The local MP has even refered to Port Talbot Parkway as an important gateway station to West Wales. Now, the reason for this could, as you suggest, be that there are more frequent services from Port Talbot (particularly if you want to go to London without changing train). However, I personally think that it probably also has more than a little to do with the fact that it takes 45mins to drive from Carmarthen to Port Talbot Parkway (according to the AA journey planner) but to do the same journey on a train and will probably take over 1h 10mins (because the train will probably go via Swansea). The use of Port Talbot Parkway happens for 2 reasons. Firstly the time saving – Whitland to Port Talbot is a little less than 1 hour except at peak times and this is an issue. 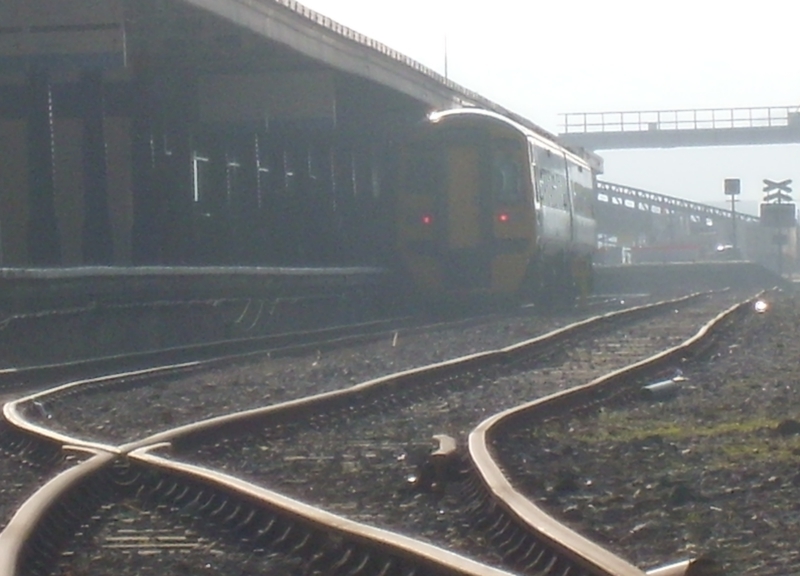 The second is that 15-20 years ago that timekeeping of HST Paddington to Swansea services was so abysmal that connections to West wales were frequently missed, resulting in delays to Pembrokeshire of around 90 minutes on frequent occasions, the length of time resulting from the 2 hourly service frequency to Milford or Pembroke. At the same time conversations with Cardiff taxi drivers indicated that many had carried passengers from Cardiff to Fishguard to connect with the ferries – it was strange talking to a Cardiff person who knew the street layout of Fishguard almost as well as I did!! It is telling that Whitland to Port Talbot via the Swansea District line at around 1 hour 10 minutes, or Port Talbot to Carmarthen in around 55 minutes would be competitive with road journey times. with regard to infrastructure along hte Swansea District line a recent journey showed that much work has been carried out recently on stabilising cutting sides as well as maintenance to the 2 major bridges in the Swansea Valley area – at Ynysforgan viaduct and over the Tawe near Felin Fran, something which should be celebrated. Since 2011 Fishguard Trains has provided a news and discussion forum for the successful new rail service. That service is now established as part of the Welsh rail network. We look forward to 2018 and the new Wales franchise finally delivering an all-Wales rail service fit for the 21st century. Meanwhile Fishguard Trains takes a well-earned rest, and these pages stay online for historic interest. If the story really merits it, we might post new material from time to time, but no promises. Thanks for your support and keep taking the train. Click the links for Fishguard rail times. David James on More than that from Ferryside?